and woundrously Earth bore them all. God gave them breath that Sabbath eve. our image be, our likeness bear. and all the earth into your care. her fruits will give you nourishment. one with another ordered right! revealed within the Trinity. Amen. I am deprived of the rest of my years. shall I look on any creature. pulled up like a shepherd’s tent. to cut from the loom. care for me, Adonai, be my safeguard. My spirit will live for you alone. restore me and make me live. bring me back from the pit of destruction. nor does death extol your Name. I have heard your prayer and seen your tears. I will add fifteen years to your life. and applied to the boil, that he might recover. R. I thank you, Adonai, with all my heart, *you have heard the words of my mouth. V. You stretch forth your hand, and heal me; *you have heard the words of my mouth. V. Glory to the Abba and to the Word and to the Holy Breath of Life. For I have not come to call the just but to call sinners. For the healing waters of creation, which bring pleasure and health, purity and life, ~ We thank you. For the richness of Mother Earth, who brings forth fruits and flowers, a pleasure to taste and a joy to behold,~ We thank you. For the soaring birds of the air, the crawling creatures on the Earth, the gliding fishes in the seas, for all creatures great and small with whom we share this precious web of life, ~ We thank you. For the invigorating sunlight of day, the deepening mystery of night, the wonder of the stars, and the call of the unknown in the universe, ~ We thank you. ~ O God, deliver us. From squandering resources, abusing our companion species, and polluting the habitat we all share,~ O God, deliver us. 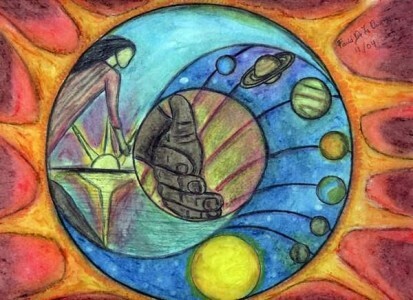 From the folly of imagining ourselves the center of creation,~ O God, deliver us. ~ Strengthen us, O Spirit. May the hallowing of your Name echo throughout the universe! Creating and Sustaining God, as we celebrate the sixth day of the week, we praise and thank you for the wonder and beauty of all the creatures that You have made, for each one of them reveals something of Your inexpressible love. Awaken in us such a sense of wonder and delight that we receive with gratitude the gifts that Mother Earth provides to supply our needs, generously share these gifts with all your creatures, and lovingly care for our common home—all to the honor and glory of your Holy Name. Amen. Mother of Mercy, Our Queen we greet you. Our life, our hope, our happiness we hail you. We call to you as Eve’s own children, and exiles. To you we lift our hearts in sorrow and fear, in this valley of tears. Turn then, our loving Advocate, and look with favor upon us. And after our life in exile, show us the blessed fruit of your womb, Jesus. O gracious, O loving, O Virgin benign, our Mother Mary.